If you are driving through Kilmallock it is impossible to miss this impressive 15th century four storey tower house. The castle, which spanned S John's street, is named after King John, who died in 1216, but was built much later. There are some original mullioned windows still present but most were replaced with 18th century windows. 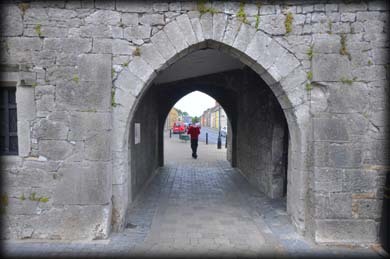 An archway at street level gives it the appearance of a gatehouse. In 1645 the Catholic Irish forces under Lord Castlehaven used it as an arsenal and later Cromwell's army used it as a hospital and depot. Pictured above are a some of the windows and openings. 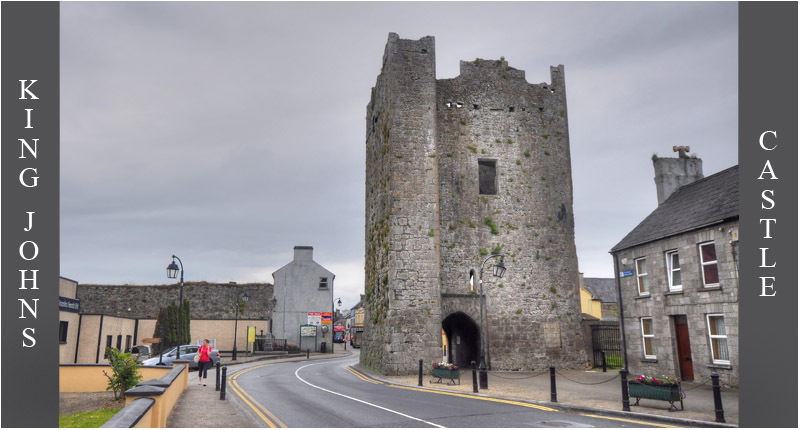 Kilmallock is fascinating town to visit, with lots of structures dating to the medieval period. These include a fabulous merchants house east of the castle, a 13th century Dominican Priory and a collegiate church, all of which are inside the medieval town walls. One of the original town gates, Blossom Gate, is also present on Emmet Street. Situated: Easy. The tower house is located at the north end of the town on the R512. Discovery Map 73: R 6075 2791. Last visit June 2015.